Dispatched by the Wayfinders' faction leader to a Near Space world, the PCs have orders to assist a local Starfinder research outpost. The outpost's head researcher sends the PCs on a mission to explore a strange calcified region, which soon reveals that there's more happening on this world than first appears. Let me start by saying that this is one of the only scenarios to feature vehicle combat, so if your character happens to own a vehicle, this is definitely the scenario to bring them on! This scenario tasks the PCs with assisting a science team in performing a survey of a strange landmass. Nearly 85,000 square miles in size, with no water or plant-life, this calcified plateau is of great interest. Your asked to travel across the plateau to three specific locations, set up some specialized towers you brought with you, and calibrate surveying equipment atop of each one. Each tower has its own challenges, hazards, and enemies to contend with. There’s multiple vehicles your PCs can choose from, (or bring your own!) and the towers can be tackled in any order. There’s a simple vehicle handout that will be useful for both players and GMs, which is a nice touch. I love how flavourful the new creatures and environmental hazards are. A lot of thought has gone into ensuring they fit into their ecosystem — which is particularly important when players are surveying an environment. Also, I particularly enjoyed the mystery of the old kasathan ship. I do have one nitpick. Page three is missing half of a sentence at the end of the first section, which I assume should read something along the lines of ‘up to help,’ ‘up to lend a hand,’ or something else similar. It’s not a hindrance to the scenario. You can still get the gist of what it’s supposed to be saying, but it was jarring enough that it caused me to look around in confusion for a half a minute, to make sure I hadn’t missed anything. A minor distraction in an otherwise enjoyable read. Overall, I loved I this scenario! The premise is different from any that have come before. It was engaging all the way through, with a wonderful array of social interactions, skill-based encounters, hazards, and combat. The enemies and hazards were all well-thought out. The NPCs were properly engaging and ‘real.’ And, best of all, your PCs have to make an important decision regarding the future of this planet. Really top notch! 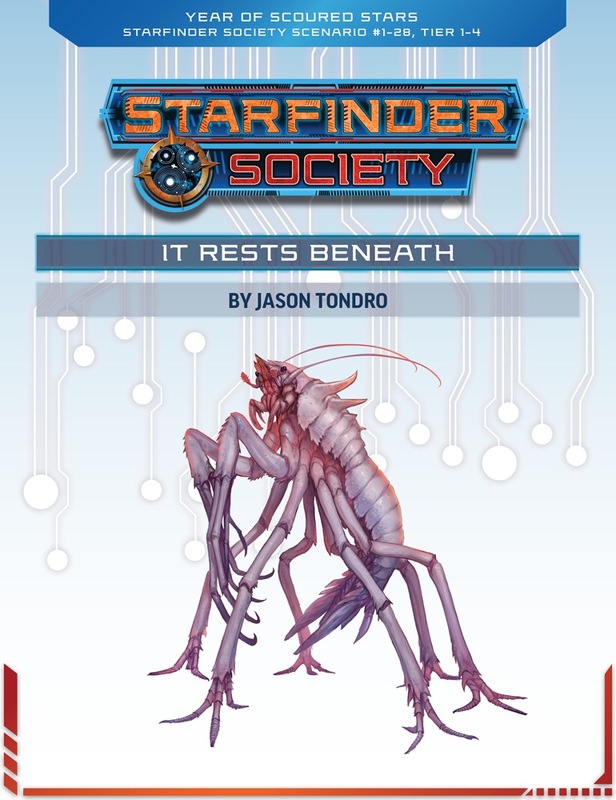 Although it didn’t blow my mind, like some other amazing Starfinder adventures, it was an… understated awesome. Looks like there is an edit error in the background information just before the summary. At the bottom of the column, it cuts off mid-sentence.